Communication can be a very powerful tool for educating and supporting youth. When children are little, we feel that the “why?” questions will never end. By the time our children are in middle school, however, we wonder if we will ever be able get a response to a question that is more than a “yeah” with an accompanying eye roll. We know that getting tweens and teens to talk about anything can be a huge undertaking and getting them to talk about the serious, important, and scary parts of their lives can be nearly impossible. But, maybe, entertainment media can help. To the surprise of many critics, our recent research, published in a report for the Center on Media and Human Development at Northwestern University demonstrates that viewing 13 Reasons Why – an intense, graphic, and emotional original Netflix series about a teen’s suicide – may have supported conversation between teens and parents. Somewhat surprisingly, even the adolescents felt the show supported conversation with their parents and many adolescents reported that they actually asked their parents to watch the show. Although the show was developed as an entertainment program, Netflix creative executive Brian Wright acknowledged that they wanted this to be something that supported communication and enhanced empathy; our research suggests that it has done just that. Parents in four regions around the world reported that they felt it was easier to have conversations about tough topics with their adolescent, including sexual assault, depression, and suicide after watching 13 Reasons Why. Additionally, many adolescents reported that they feltmore comfortable talking to peers, parents, teachers, and counselors about these same topics after viewing. Parenting experts suggest that parents should learn about the things that are of interest to their adolescent as a way to connect, but as many parents know, finding a shared interest between a parent and teens can be difficult. This research suggested that 13 Reasons Why may be that shared interest, or at least a shared experience that can help prompt parents and adolescents to talk about these topics. While the 13 Reasons Why is intense and covers some very tough topics like peer sexual assault, online and offline bullying, and suicide, these are issues that tweens and teens around the globe experience. It is often hard for parents to get their teens to open up about their own personal experiences with these issues, as teens are seeking independence and are desperately trying to convince themselves that they don’t need their parents like they used to. However, teens do need their parents and want their parents to know and talk about these issues with them. The problem is that they generally don’t know how to ask or talk about these topics – and neither do their parents. This is again where a show like 13 Reasons Why may be of help. By watching the show together, or even separately, parents and adolescents can have a shared experience. Parents can get a glimpse into a fictional storyline that, according to many adolescents, feels like an authentic depiction of high school life. Adolescents can have faces and names of fictional characters to provide some distance in order to discuss issues, emotions, and circumstances that may be happening in their own lives. Rather than talking about their own struggles, they cantalk about how they can relate to the characters in the show. While this research demonstrates that this show can help many parents and adolescents feel more comfortable talking about these difficult topics, parents and adolescents asked for more resources to help them have effective and positive conversations with their children about these topics. Netflix provides additional resources here. Overall, this research points to the powerful role that media can have in bringing parents and children together in a shared experience that supports conversation for many families. Although certain depictions may seem intense, we found that exposure to 13 Reasons Why helped many adolescents feel more comfortable expressing their thoughts about mental health to supportive adults, and prompted many parents to discuss these topics with their teens. These are important, positive findings in the context of parent-child communication, and the well-being of adolescents. Kindergarteners are fun. They can have full conversations with you and complete tasks you ask of them (e.g., clearing their plate from the table). Toddlers are exciting, Their language is developing at such an amazing rate that it’s hard to keep track. One day they are putting two or three words together, the next they are making you laugh hysterically with their short, but adorable sentences. Even older infants are entertaining. When they say their first words or utter “momma”, “dadda” or the dogs name for the first time, parents melt and then talk incessantly trying to get them to say these words again. What about newborns? Adorable yes, but interactive? Not exactly. And early on, they are provide few verbal interactions, limited to the cry and shout-out variety. This can make it tough for parents to know how or want to interact with their babies. But this is an important time for brain and language development and all the language and interaction parents can do with their tiny babies can help. So here are some ideas of ways to interact with your very teeny, tiny, newborn. 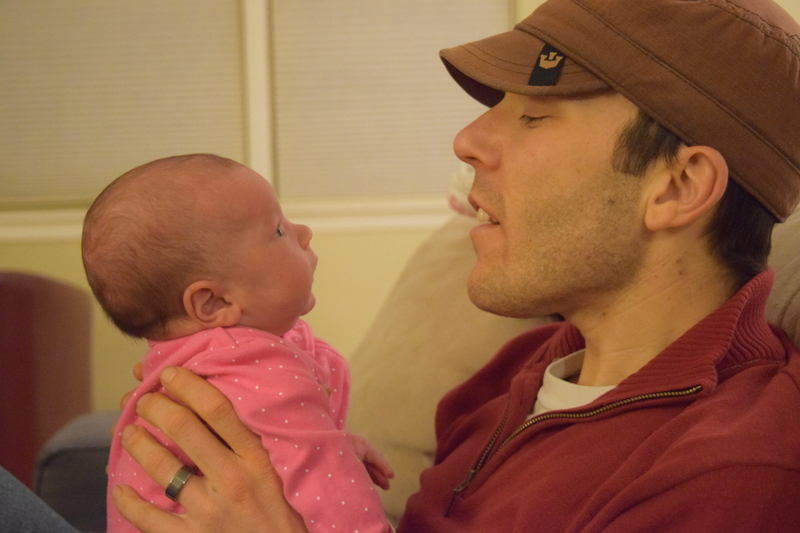 Remember to use your parentese voice- that singsongy voice that adults automatically use when talking to babies. 1, Have a Conversation. Pretend you and your baby are having a conversation. Ask her a question and give her time to respond. If your baby has started cooing, give her a chance to coo in response and then you respond as if she told you something fascinating, This back and forth exchange is great for language development and something you can start as early as birth. 2. Read books. You may have been given a bunch of board books for your infant, these typically contain one picture and one word per page. You can read these to your infant, but it might be incredibly boring for you. Instead invest in some classic kids books like Dr. Seuss, Corduroy, The Giving Tree, Where the Wild Things Are, etc, and read these to your newborn. They will be more enjoyable for you. At this point your baby is benefiting from the language interaction and is not so focused on the storyline and plot so it won’t matter that it is above her comprehension level. On that note, you can also read aloud whatever adult book, blog, newspaper, or magazine you are currently reading. Remember in the movie Three Men and A Baby, when Tom Selleck is reading a trashy novel to the baby using parentese and says it doesn’t matter what he says, its his voice that the baby likes? Well, same idea, the language helps so read something you enjoy sometimes too. 3. Tell stories. Sometimes new parents aren’t ready to be the creative storyteller yet, but storytelling doesn’t have to be the plot for the next Harry Potter series. Tell your baby how you and your partner met. Tell her about your favorite vacation or that embarrassing moment in college. My father, an architect, told our baby details about every building in Chicago. Again, it’s the language and interaction that matter not necessarily the content at this point. 4. Sing Songs. Look it doesn’t matter if you could be a competitive singer on American Idol or if your dog whines in pain when you sing, singing to your baby is a great way to increase your interaction with him and help your baby’s language development. Some baby favorites are the ABC’s, The Wheels on the Bus, London Bridge, Hickory Dickory Dock, Baa Baa Black Sheep, Ants Go Marching (a great list of songs with lyrics can be found here). Hope these ideas help and happy chatting! Pregnancy is a unique period in which you have time (9 months) to prepare for parenthood. While this is a lovely, relatively long period of time, it is also the only period that you really have to prepare for the next 18- 30 years of this child’s life and your role as a parent. Of course you can read books, talk to other parents, join support groups, once your little one arrives. And you are “parenting” already during pregnancy when you are growing this person inside of you, but as all parents will tell you the time to do just about anything disappears as soon as that baby is delivered. Once you get pregnant you may begin to read one of the 45,000 books about pregnancy (according to Amazon.com) (e.g., What to Expect When You Are Expecting) or articles from Baby Center to help guide you through the next 9 months of daily changes that are happening to you and your baby. You may take a class or read up on information related to labor and delivery. If you are particularly on top of things you might even take some classes on caring for infants or Infant CPR, or read about life postpartum and life with a newborn. And yes, there are the basic guidebooks for child development indicating when your child should reach certain milestones, like eating solid foods, crawling, walking, etc that you may flip through as you are trying to understand this wild child that has suddenly taken over your home. But what about the discussion about parenting? When do you read those books? Take those classes? When do you think about your new full-time job as a parent and how you are going to approach it? In the US, there is support and encouragement for parents to prepare themselves for pregnancy and labor but minimal interest in preparing them for the ever-changing and ongoing challenges of parenthood. Im curious when parents start to think about and plan how they will parent. Assuming there are two parents (but many of these ideas are relevant and should be considered if you are single parent), when do you have the conversation about how you will talk to your child, how many books you will read each night, your philosophy about rewards and punishment? Do you just wait and see how it goes and then figure out if you and your partner actually agree about the bath, book, bedtime routine? Do you wait for your toddler to have a complete temper-tantrum, meltdown at the grocery store and then decide which of his demands you are going to give in to or how you are going to respond? What about sleeping arrangements? Are your children going to sleep in their own room or will be they bunking up with you? What about sleep and potty training and when to start and how to do it? What about introducing new foods or exposing your chid to different cultures or customs? What about religion, education, political views? What about rules and expectations for behavior and tone of voice? There are so many things to consider as parents, some big and some small, and many that we won’t even know about yet because they aren’t invented (like the future cell phone/tablet debates whatever they might be), but this is a recommendation to begin to talk about and consider some of these things now regardless of where you are on the parenting spectrum. Of course, children change everything.You can have these grand plans for how you are going to parent and they could go completely out the window once you meet your little one and see their temperament and behavior. But why not make a game plan in the same way you make a birth plan prior to delivery? Every doctor, nurse, midwife, and friend will tell you that your delivery will never go 100% according to plan, yet we write out an ideal birth plan months in advance of our delivery. My suggestion is that we also do that for parenting, at least to some degree. In the United States, we tend to link the word “postpartum” to two things: 1. depression and 2. body/weight loss. But postpartum from a medical perspective means “relating to or happening in the period of time following the birth of a child” according to the Merriam-Webster Dictionary. Unfortunately for new mothers, there is not a whole lot of information about this period of parenting. When you google “postpartum” you find resources on almost exclusively on postpartum depression or things related to helping your body heal or how to return your body to what it looked like pre-pregnancy, rather than the multitude of experiences that are all occurring immediately following the birth of a child. Unlike the massive world of pregnancy-related guidebooks and information, there is very little in terms or resources or advice on how to survive those weeks postpartum for new moms! While WebMD provides some basic information about the first 6 weeks postpartum, these simple paragraphs and tips do little to prepare a new mother for the reality of what is to come. A friend of mine reflected on the experience just two weeks postpartum and said “I feel like they need to stop giving classes about labor since that is the fastest and easiest part. Instead, there should be extensive classes on surviving the first few weeks.” Anecdotally it seems like people are relying on word of mouth advice and input that they receive immediately following the birth of their child, when they are most exhausted and overwhelmed and likely struggling to take any information in. Why are new moms feeling so overwhelmed and so unprepared? Well, because everything about giving birth is a new experience and there is nothing else that really happens in our life that is so completely life-changing. When else is your body changing daily for 9 months of pregnancy only to experience one wild day of labor (if you are lucky) in which your body has to physically remove the thing it has been growing and nurturing for nearly a year? Physical changes, check. Beyond the obviously physical experience, your hormones are going wild inside of you now. Oxytocin, endorphin, and adrenaline help to regulate labor and delivery but these are all over the place postpartum as well. Wild hormones, check. All of this happens in the hospital (usually) and then they send you home. With a brand new PERSON that you just created. A person who can’t talk to explain him or herself. A person who can only communicate in screams and cries! And a person who needs you to feed it, clean it, and help it sleep constantly, and read its mind for when all of these things need to happen. There is no other life experience like this, hence why it is so difficult to be prepared. That being said, you can’t easily prepare for much of anything in life and a lot of it can be life-changing, like pregnancy, for example. But yet, we try. We create resources and books, and we find experts that help to guide us through this novel and major life-changing experience. The same should and can be done to help at least begin to prepare our new moms for the the wild and exciting and completely life-changing experience of bringing home that new beautiful baby.